Halloween is such a fun yet hectic time. Cook this spooktacular recipe in advance or use your slow cooker to fill your goblins’ tummies with a delicious, nutritious fun meal. 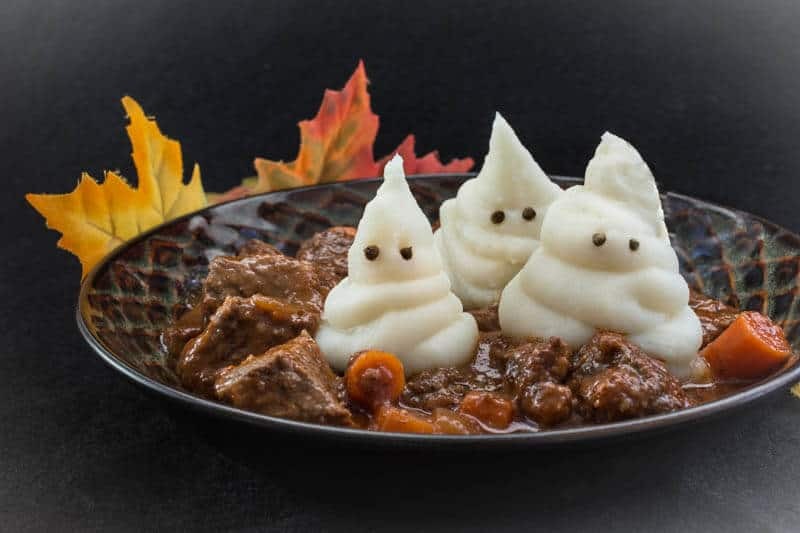 Our photographer Linda Wolpert whipped up these adorable mashed potato ghosts which you can serve on top of my Hearty Beef Stew for a Halloween-themed dinner before or after your children romp around on a chilly autumn night. Feel free to substitute other root vegetables like turnips and parsnips for the carrots and potatoes. To make the mashed potato ghosts, make our mashed potatoes or use your favorite recipe, adding extra water or milk as needed to make it smooth and creamy. Put the mashed potatoes in a strong plastic bag (sandwich-sized Ziploc works well), snip 1 inch off the bottom corner of the bag on the diagonal, and squeeze out the ghosts. The eyes can be peppercorns, coriander seeds, pieces of olives or carrots; use your imagination! Slow Cooker Directions: Place the carrots and potatoes in the slow cooker. Dredge the meat in the flour and reserve 1 Tbsp. of the flour. Heat the oil over medium heat in a large skillet and brown the meat in a single layer, flipping it once or twice. Remove the meat from the pan and add it to the slow cooker on top of the vegetables. Add the onions and 1 Tbsp. flour to the skillet. Sauté it for about 5 minutes until the onion starts to brown. Remove the onions from the pan and add them to the slow cooker on top of the meat and vegetables. Add 2 cups broth or 1 cup broth and 1 cup water (rather than 1 cup broth above), tomato sauce, wine or juice, Worcestershire and thyme to the skillet and warm through while scraping up brown bits from the bottom of the pan. Pour the mixture over the meat and vegetables. Cook for 8-10 hours on low, or 4-5 hours on high. Add extra broth or water during cooking if it looks too thick. Do Ahead or Delegate: Cut and refrigerate the beef, dice the onion, peel and slice the carrots, cut the potatoes and store them covered with water to prevent browning, combine the beef broth through the thyme, or fully prepare and refrigerate or freeze the stew. Scramble Flavor Booster: Season the stew with salt and black pepper, and serve it with hot pepper sauce, such as Tabasco. Tip: Use tongs or a spatula to flip the meat while browning. Using a fork or other sharp object to puncture the meat will release its flavorful juices. Bring a large pot that’s about half full of water to a boil. Peel and cut the potatoes into 1-inch pieces. While the water is coming to a boil, add the potatoes, the garlic clove and about 1 tsp. of the salt to the water and simmer for 10 – 15 minutes until the potatoes are fork tender. Drain the potatoes and garlic and return them to the pot over medium heat, shaking until any remaining water dries. Transfer the potatoes and garlic to a large mixing bowl; add the butter or margarine, the milk (or buttermilk, if you have it), thyme and remaining salt. Beat with an electric mixer on medium speed until they are just smooth—don’t over mix (or mash them, if you prefer). Serve immediately or transfer to an oven-safe serving bowl and keep warm in a 300 degree oven until you are ready to serve. « This Letter Made My Day! Sorry we missed adding that, I’ve added it now, but it’s 8 servings. I LOVE a good beef stew. This one looks so yummy and cozy!